This year we decided to give growing our own fruit and veggies a go. We had some very successful results and some pretty poor results out of what we were attempting. Chris set about building us our trough to plant in. This was partly to protect it from being eaten by slugs but also our guinea pigs. We had all sorts growing. In the trough we attempted rainbow carrots…. 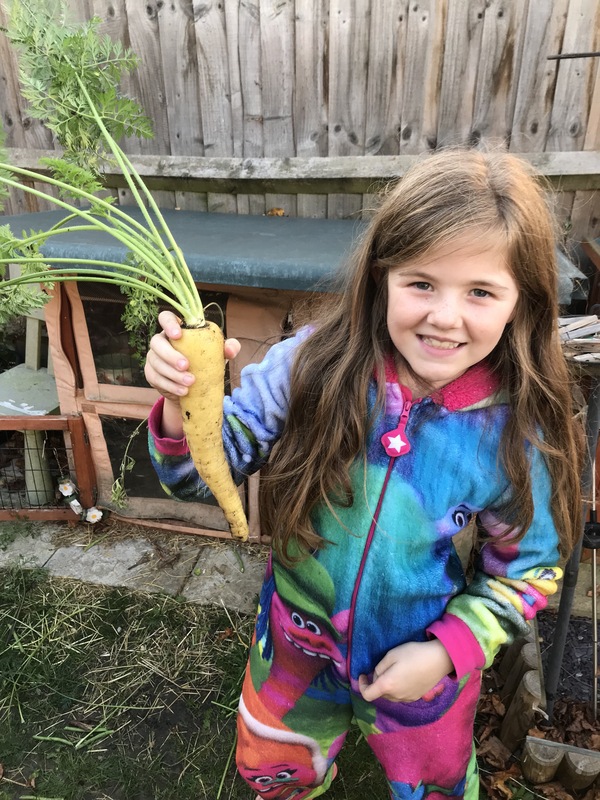 here modelled by Niamh is the smallest carrots. And lastly the strangest looking carrot. A pair of trousers…. We also grew some beetroot which tasted amazing roasted and added to a warm beetroot and goats cheese salad. One thing I did learn about the beetroot is the need to be more liberal when thinning the seedlings and perhaps to sow less seeds at once next time. This was the most successful of the lot grown. The not so successful veggie grown in the trough was the radishes. They were actually covered in caterpillars when we went to harvest them which daft I know put me off eating them a little bit, but actually they were pretty woody and hard to chop and looked slightly enedible. Not something I think we will bother trying again. The carrots and beetroot will however return next year. With lessons learnt. 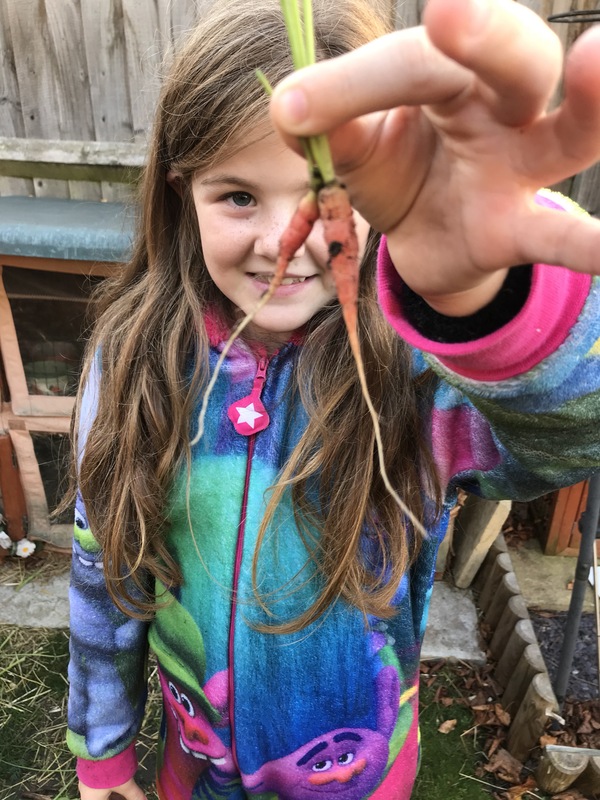 The girls really enjoyed growing and harvesting the things they had planted and if nothing else it at least taught them a few things. This is Niamh harvesting the first of the crops in the summer. And Ellie showing us what she had grown too. We have had a cherry tree in our garden for at least 4years now with 3 years of successful fruit. However this year gave us the most cherries and we got to them before the birds started to help themselves. We attempted a few recipes with our harvest which you can look at here…. And the rest remain in my freezer for when I have inspiration for something else to try. Our strawberry plant was not very generous at all and this is all it grew. I’m not quite sure why it didn’t flower as much but it’s something I’m willing to try again next year. We also attempted salad which didn’t even get past the first stage before the slugs found it and we also attempted a few different herbs. None of which have done brilliantly and I’m putting that down to the size of the pot so I plan to transfer to our flower bed to see if they continue to improve with more space. 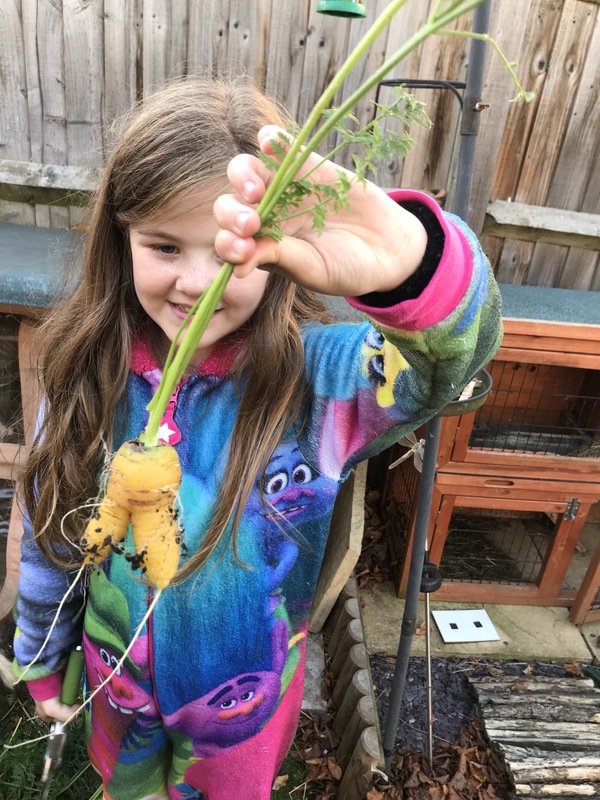 Next year we would like to attempt potatoes and I would like to grow some tomatoes and space permitting may find somewhere to grow a pumpkin or 2. Seeing all the amazing pumpkins this month has had me wishing we had tried to grow one. So what have you successfully grown and what works well in a trough? I’d have things growing in the ground but the guinea pigs have a very good sense of smell to hunt them out.